History buffs from Maryland, Pennsylvania and Virginia gathered today in Allegheny Cemetery to honor the memory of a man who was a hero during both the American Revolution and the War of 1812. 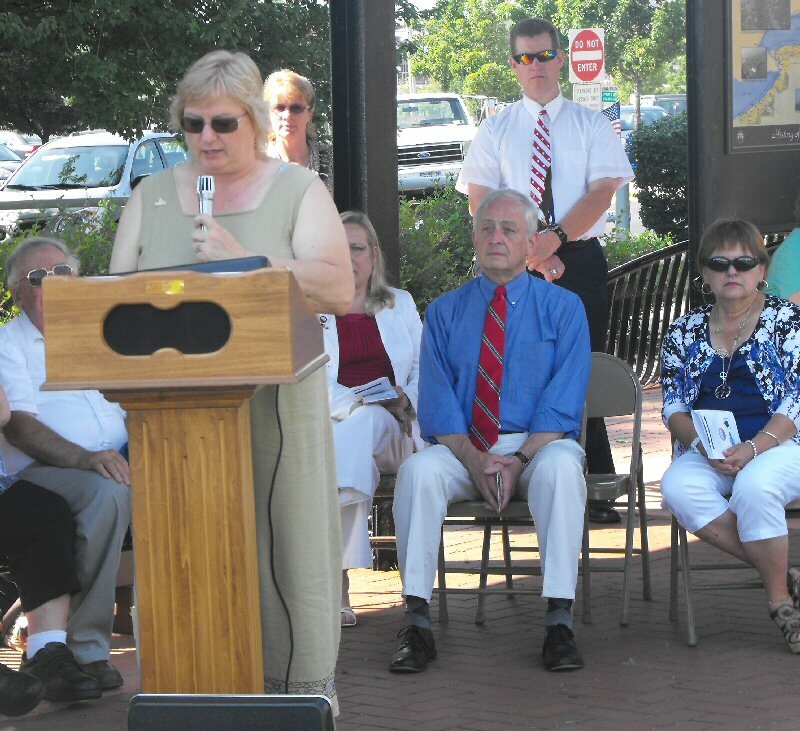 The event, which saw the dedication of a memorial stone honoring Barney, was sponsored by Maryland chapters of the Daughters of the American Revolution, Sons of the American Revolution and United States Daughters of 1812. Four of Barney's descendants took part in the program, which drew about three dozen people to the Lawrenceville cemetery.Mary Jane Stockstill, an eighth-generation descendant, described Barney as "a faithful and obedient servant to our country." Caroline Bradford, another descendant, described her ancestor's role in ordering the making of the "Star-Spangled Banner" -- with 15 stars and stripes -- that flew over Fort McHenry during the British siege of Baltimore in 1814. 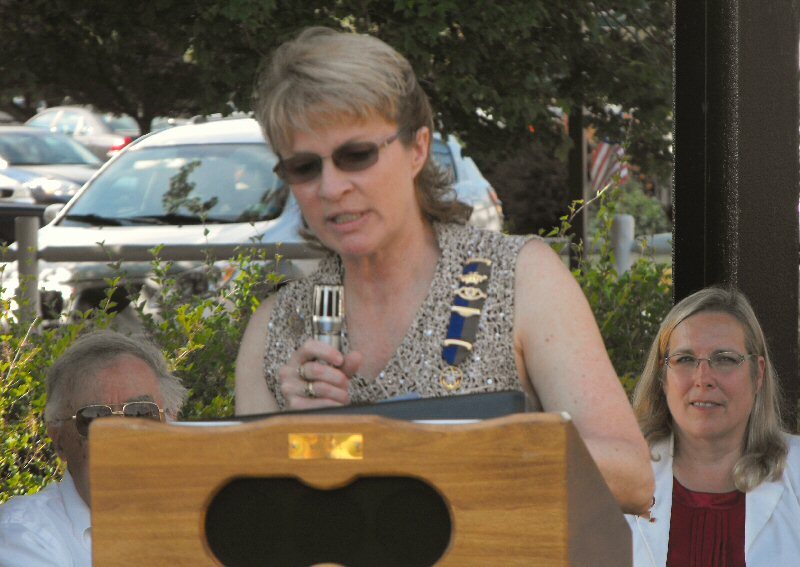 Laura Smith, regent, or president, of the Pittsburgh chapter of the DAR, read a proclamation from Mayor Luke Ravenstahl declaring Aug. 4 to be "Commodore Joshua Barney Day" in the city. The 10-by-24-inch stone marker was provided by the Col. John Eager Howard Chapter of the Maryland Society of the Sons of the American Revolution. John Eager Howard, a contemporary of Barney, was a Revolutionary War soldier who later served as a U.S. senator and governor of Maryland. This image released by the U.S. 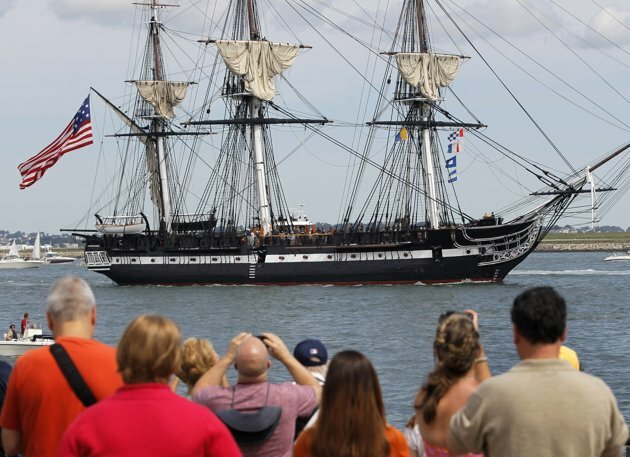 Postal Service shows a forever stamp unveiled during a ceremony in Boston Saturday, to commemorate the historic USS Constitution warship. BOSTON (AP) - The U.S. 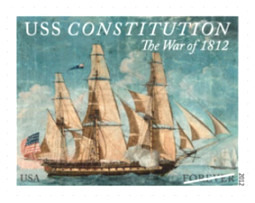 Postal Service has introduced a stamp commemorating the world's oldest commissioned warship that's still afloat.On Saturday morning, postal officials unveiled the USS Constitution forever stamp at the Charlestown Navy Yard in Boston.The stamp is the first in what officials say will be a stamp series commemorating the bicentennial of the War of 1812.Nicknamed "Old Ironsides," the ship was first launched in 1797.The stamp image is based on a painting that Michele Felice Corne did of the vessel around 1803. A Bicentennial commemoration and reenactment of the first major battle of the War of 1812, portrayed on the actual dates. 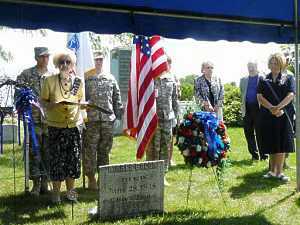 ALBION — A veteran of the War of 1812 was honored in services Saturday at his grave in Union Cemetery Moses Bacon owned the farm on Route 98, just north of Albion, where Watt Farms is now located. The cemetery is also on the property. Elfreda Stangland of Albion, a member of the Niagara Frontier Chapter of the Daughters of the War of 1812, organized the event, which began at 11 a.m. at the Cobblestone Museum in Childs. Elfreda Stangland of Albion, a member of the Niagara Frontier Chapter of the Daughters of the War of 1812, organized the event, which began at 11 a.m. at the Cobblestone Museum in Childs. 101st Cavalry from Niagara Falls Air Force Base, followed by the Pledge of Allegiance led by Jan Johnpier, president of the State of New York Society, USD of 1812. Bagpiper Mo Britt of Lockport provided patriotic music at the Cobblestone Museum and during the grave marking ceremonies which followed in the cemetery. While at the Museum, Lee Simonson, author of “Tuscarora Heroes,” presented a program on Western New York during the War of 1812. Events at the cemetery included placing a wreath on Bacon’s grave by members of Boy Scout Troop 164 of Albion, and remarks by town of Gaines historian Dee Robinson and Orleans County historian Bill Lattin. Robinson said the Watt farm was owned by Bacon and two brothers. After the war, Moses sold the east part to Hosea and the north part to Elias, reserving 100 acres for himself. Moses moved to Albion from Connecticut about 1809. He joined the war effort in 1813, and in December 1814 he participated in the battle of Fort Erie, where he was shot in the neck and captured by the British. Moses was one of 1,000 prisoners captured on the Niagara Frontier and taken to Halifax Prison, where Robinson said he was treated poorly. Men slept in four-tiered hammocks and had no shoes or jackets. Bells will be ringing in Lake Wales on Monday to commemorate the 200th anniversary of the start of the War of 1812. Bells of the Catholic, Episcopal, Methodist and Presbyterian churches will join the Bok Tower carillon at noon to mark the occasion. “If you have a bell and would like to help remember the start of the second war for independence please join in, says Karen Wolzanski, representative with the Daughters of the American Revolution. The War of 1812 was declared by Congress and signed into law by President James Madison on June 18, 1812. “There were many reasons for legislators to vote for the war. A well known motive was the impressment of American seamen into the Royal Navy. A more important explanation for the southern senators vote was Britain’s support of native North Americans. By creating an Indian buffer state, Britain hoped to contain American westward expansion. Everyone knows that Francis Scott Key wrote the poem that became our national anthem during the bombardment of Fort McHenry. Did you know that he was accurately describing the attack? According to the Smithsonian Magazine, the rockets’ red glare was caused by British missiles called Congreves, which looked a bit like giant bottle rockets. They were a long stick attached to a cylindrical canister filled with gunpowder, tar and shrapnel. Congreves were inaccurate but intimidating; an 1814 version of shock and awe. The bombs bursting in air were 200 pound cannonballs, designed to explode above their target,” said Wolzanski. The Treaty of Ghent, which ended the war, was ratified by the United States on Feb. 17, 1815. According to this treaty, neither Great Britain nor the Americans gained territory from each other. However, the United States acquired Mobile, Ala., and parts of west Florida from Spain as a result of the war. Ring the Bells for 1812 is a nation wide program sponsored by the United States Daughters of 1812. The Benjamin DeVane Chapter is supporting the project in Polk and Hillsborough counties. For information about joining USD1812, contact Karen Wolzanski 863-692-0038. 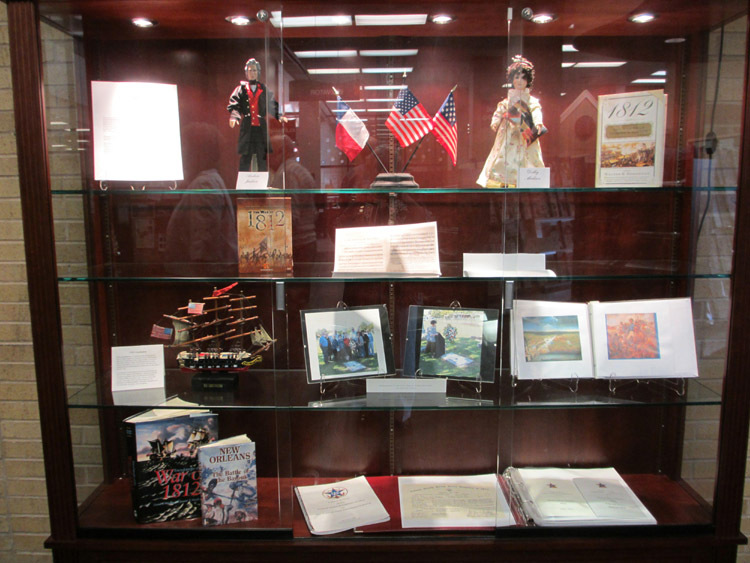 War of 1812 Display at the Washington Memorial Library, Genealogy Room, in Macon, GA.
President: Daughters and guests, we have come to this place to honor the memory of our beloved ancestors whose valor we will never forget. Chaplain: Hear, O Lord, give ear to understanding. All ye that worship the Lord, Praise Him and giv Him thanks. President: Praise the Lord so that He shall receive great honor, and an everlasting name. Chaplain: O give thanks unto the Lord, because His is gracious and His mercy endureth forever. Response: God is our Sun and Shield, our Light and our Defense. Chaplain: Peace like a river from His throne shall flow to nations yet unknown. The peace of God which passeth all understanding shall keep your hearts and minds, through Jesus Christ. Response: For it is better for us to die in battle than to behold the calamities of our people and our sanctuary. Chaplain: God is our refuge and strength, a very present help in trouble. Response: One generation passeth away, another cometh, but the earth abideth forever. States Daughters of 1812 gathered here shall bear in mind the noble service which our forefathers gave to these United States. Make us ever mindful of our obligations to them and to all mankind. Direct us this day in all our doing and give us grace to be wise and just, and to further Thy cause of Peace, Charity and Good Will to all nations. We ask this in Christ’s name. OSWEGO, NY – Nearly 80 people showed up Saturday afternoon in Leotta Park along East First Street to officially dedicate Oswego’s Peace Garden. 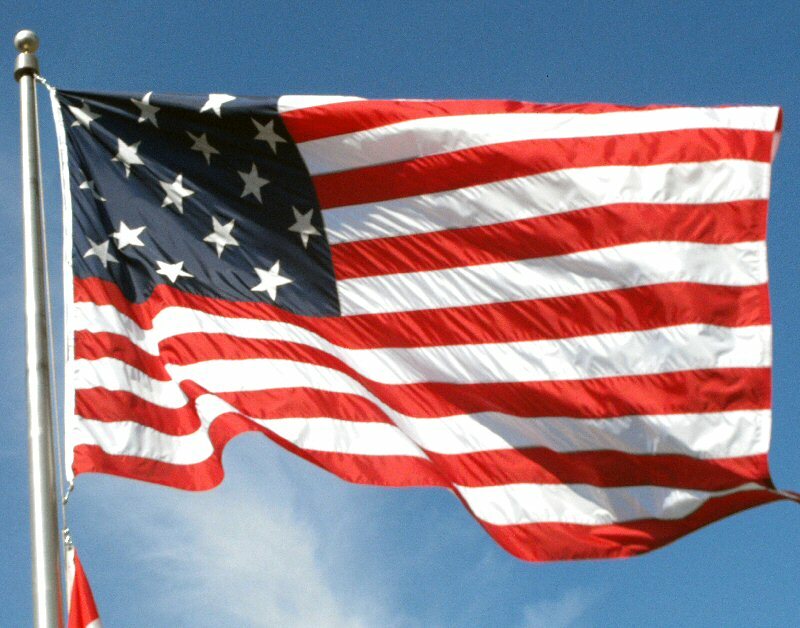 A huge American Flag, with 15 stripes, fluttered in the breeze. 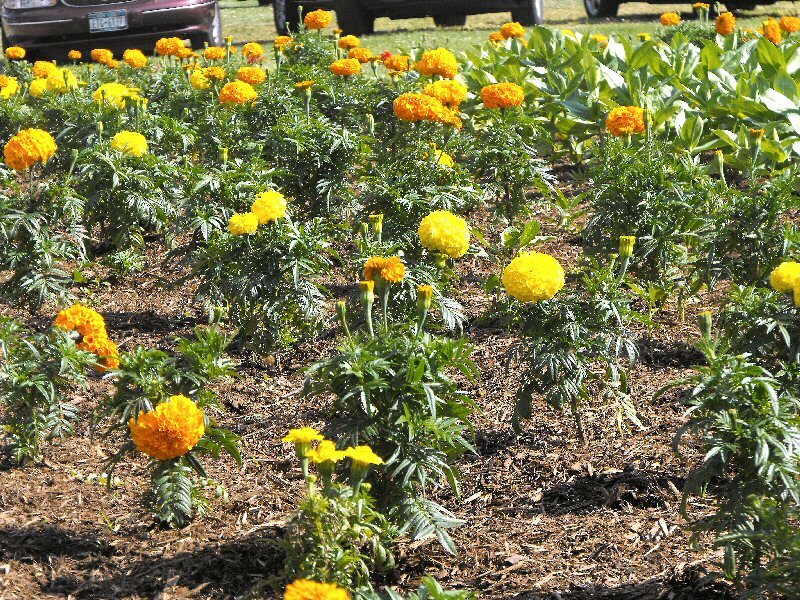 The garden was originally developed in 2003 by Leotta, the city engineer, and the Jay Saternow family, and several volunteers from the community. 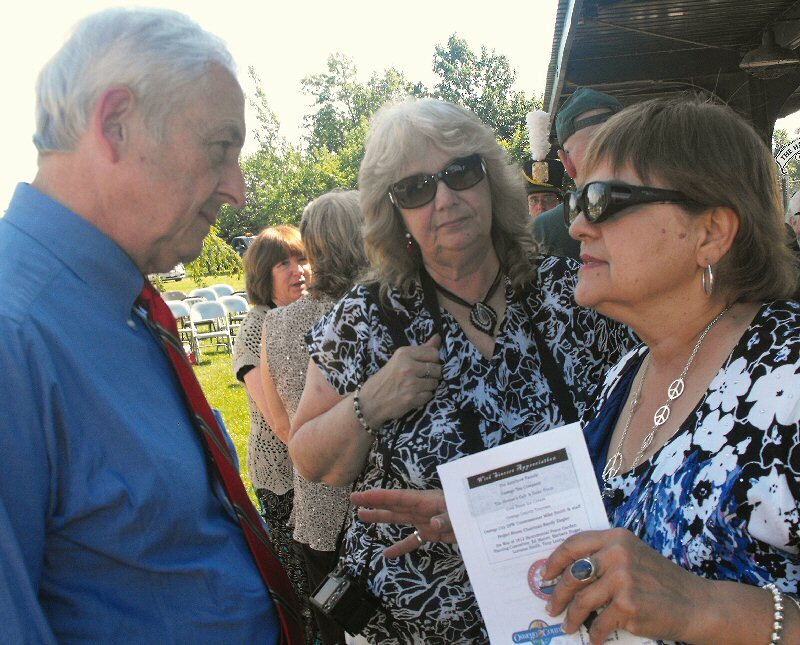 Mayor Tom Gillen chats with Joyce Lorraine, USA project manager of the International Peace Garden Foundation, center, and Paula Savage, president of the group, prior to the ceremony. 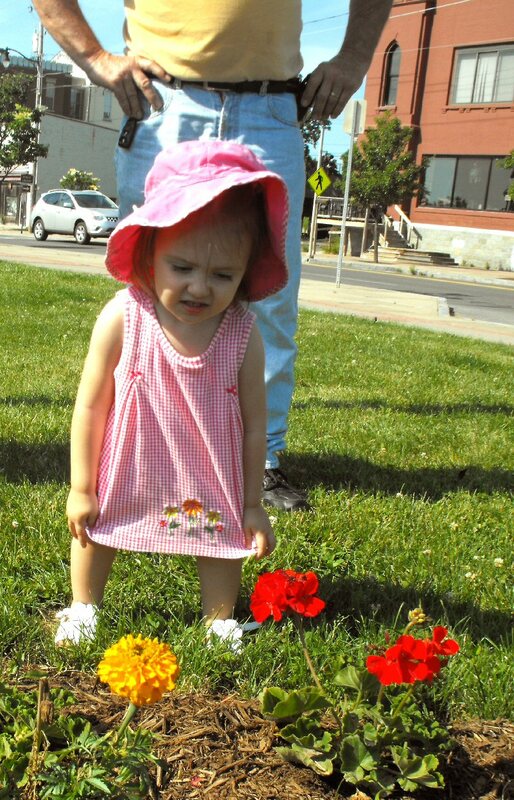 “It was named a ‘Peace Garden’ by the late Frank Clavelli Sr., former member of the Oswego Common Council,” Leotta pointed out. He and the city’s Department of Public Works along with a group of volunteers have cared for and maintained the garden for the past several years. 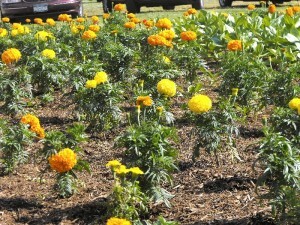 The oval-shaped garden was recently expanded and planted with a colorful assortment of marigolds, zinnias, cannis and geraniums. 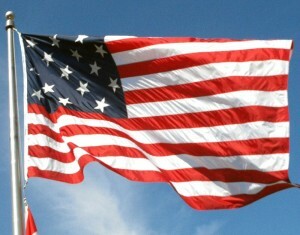 The 15-star and 15-stripe, 1812 flag has been ordered to fly over the garden. New signage will be installed to identify the garden as an official site of the War of 1812 Bicentennial Peace Garden Trail. Sophie DeCaire shows her disdain at being told she can't pick any flowers from the Peace Garden. The garden route covers more than 600 miles in the U.S. and Canada and includes 17 peace gardens in communities where events took place during the War of 1812. Joyce Lorraine, USA project manager of the International Peace Garden Foundation, said the first gardens were in recognition of sharing the longest undefended border in the world since the War of 1812. “Since then, these peace gardens have been going around the world, from country to country,” she said. But, she said, there is a lot more to the War of 1812 than just the Niagara River. And so, it became a much larger project. 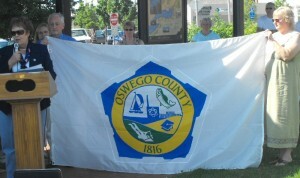 Legislator Louella LeClair presents the city with a county flag. Holding the flag are Mayor Tom Gillen and Mercedes Niess, director of the H. Lee White Marine Museum. “We’re celebrating 200 years of peace between the United States and Canada,” Savage noted. Mayor Tom Gillen said he was honored to have the Peace Garden in the Port City. He praised all of the dozens of volunteers who made it a reality; especially Leotta, one of the driving forces behind the creation of the garden. The garden is actually situated within the confines of Leotta Park. The plaque designating the park area is still in the mayor’s office, Leotta pointed out. It will be erected “at the proper time,” he said modestly. 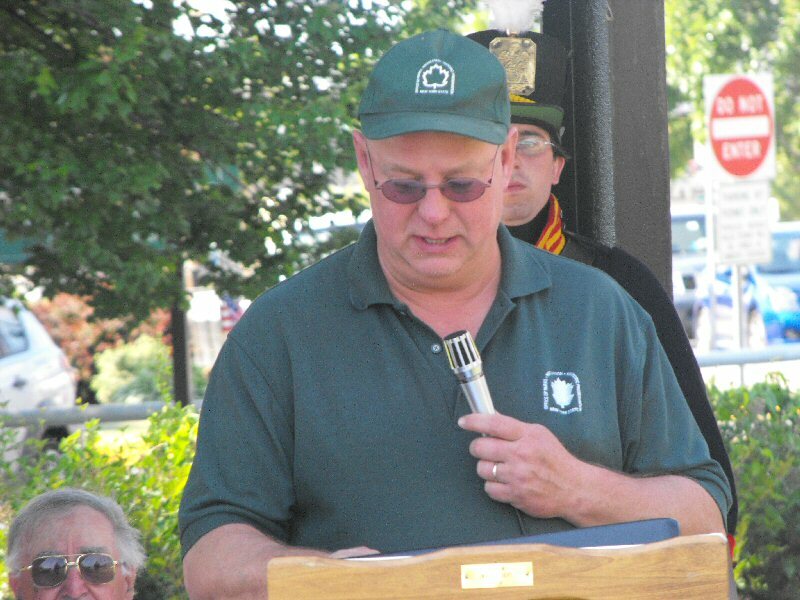 Paul Lear, superintendent of Fort Ontario State Historic Site, said Oswego was an important military site during the War of 1812, sometimes referred to as the second war for independence. 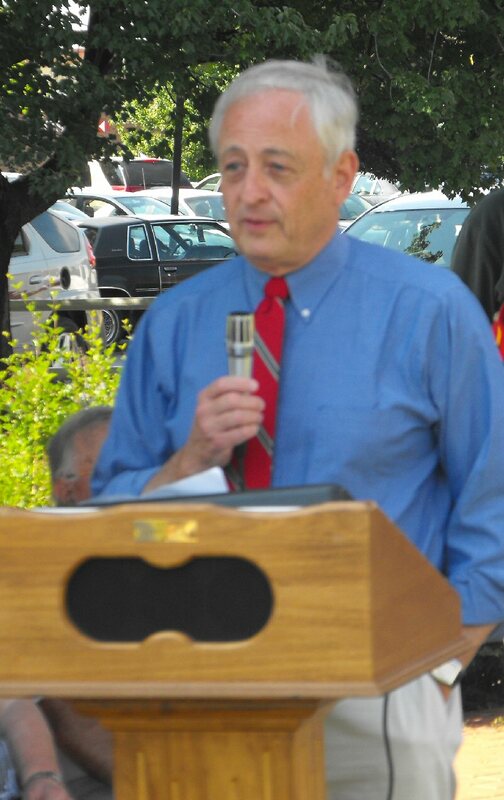 He provided the large crowd with a brief look at Oswego’s significance during the war. There were two battles here, one in 1813 and the other in 1814. “On May 5 -7, 1814, British land and naval forces conducted an amphibious assault on Fort Ontario and the village of Oswego. Lt. Col. George Mitchell, commanding 290 men of the 3rd U.S. Artillery Regiment and a Light Artillery company, 20 sailors from the USS Growler and local militia, fought off one landing attempt and stubbornly resisted a second and final successful British attack before retreating to Oswego Falls,” he said. Although Fort Ontario was ultimately destroyed and Oswego captured, the British soon left. Mitchell’s delaying tactics had provided time to remove vital naval stores and supplies upriver to Oswego Falls (now Fulton). Within a few weeks, ropes, rigging, sails, cannon, powder, and other supplies began flowing again through Oswego to Sackets Harbor. The U.S. Navy was able to maintain pace with British shipbuilders in Kingston, Ontario, in the struggle for naval control of Lake Ontario because of Mitchell’s defense of Oswego. 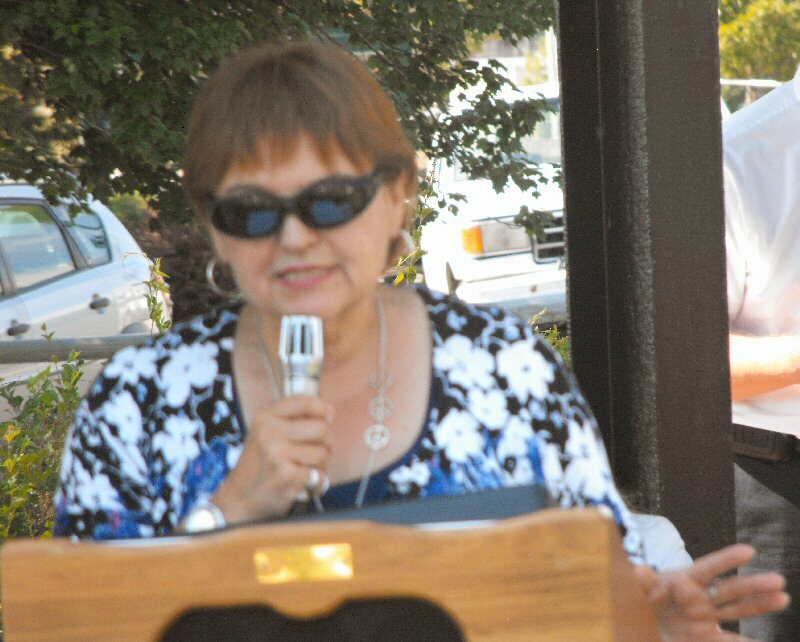 Legislator Louella LeClair presented the city with a flag to fly over the park and garden site. “May God grant our county and country peace,” she said. 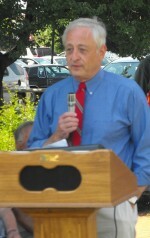 Savage gave the crowd an overview of the International Peace Garden Foundation. The Peace Garden idea was expanded to involve all areas that had an historic significance relating to the war. Today there are 18 bicentennial Peace Gardens along the trail in New York alone. Four more are currently being developed. They also foster partnerships, promote community pride and volunteerism and more, she said. Mercedes Niess, director of the H. Lee White Marine Museum, represented the Great Lakes Seaway Trail. “Later this year, the H. Lee White Marine Museum will host the new Great Lakes Seaway Trail War of 1812 traveling exhibit,” she said. There have been many donations that have helped make the park and the garden a reality, she said. Placed in Temple, Texas Public Library, Penny Worley, Jordan Bass Chapter.